Ever wondered why your business’ ads do not receive the response you expected? 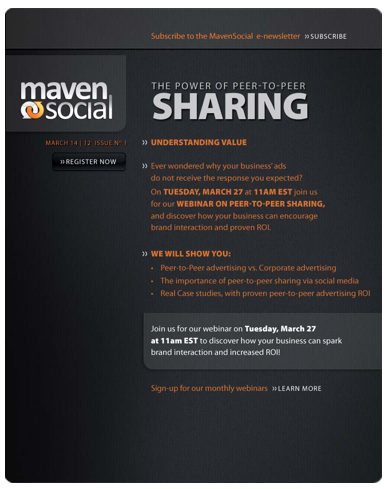 Free Webinar - The Power of Peer-to-Peer Sharing! On Tuesday, March 27 at 11:00am EST join us for our webinar on Peer-to-Peer Sharing, and discover how your business can encourage brand interaction and proven ROI. Join us for our webinar on Tuesday, March 27 at 11:00am EST to discover how your business can spark brand interaction and increased ROI! Are you able to identify the social media mega-trends that affect the success of your company every day? effect of social media on how to market. 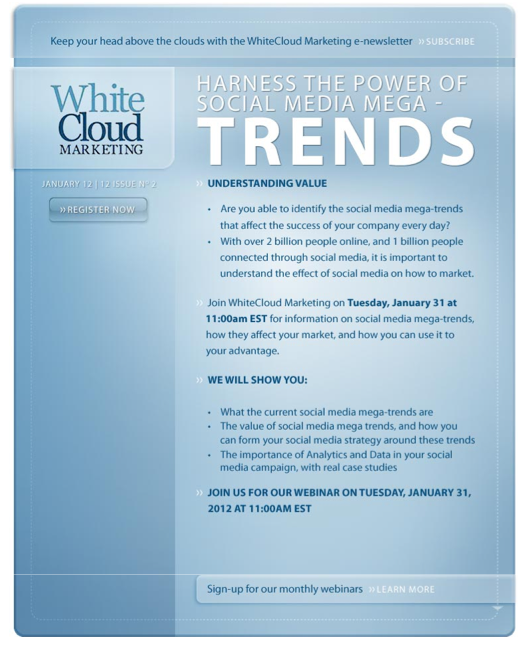 Join WhiteCloud Marketing on Tuesday, January 31 at 11:00am EST for information on social media mega-trends, how they affect your market, and how you can use it to your advantage.